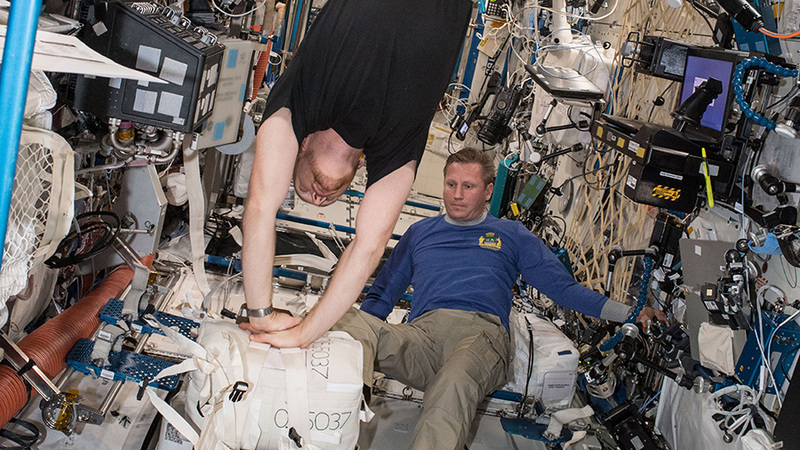 Astronaut Alexander Gerst practices cardiopulmonary resuscitation (CPR) as cosmonaut Sergey Prokopev looks on during an emergency training session aboard the International Space Station. The Expedition 56 crew has nearly completed loading the SpaceX Dragon resupply ship with cargo for retrieval back on Earth this Friday. The orbital residents are also busy with an intense day of space research and Russian spacewalk preparations. Dragon is due to be released Friday at 12:37 p.m. EDT from the International Space Station carrying several tons of experiment results and orbital lab hardware. The crew has been packing the crucial research samples this week inside specialized, portable freezers onboard the commercial space freighter. SpaceX technicians will pick up Dragon with its precious cargo after it splashes down in the Pacific Ocean and return to shore in southern California. Scientists and engineers will then begin the process of analyzing the critical space science and refurbishing station hardware. Astronauts Serena Auñón-Chancellor and Alexander Gerst spent Wednesday morning helping doctors understand how living in space impacts the human eye. They are exploring the hypothesis that upward fluid shifts in the body caused by microgravity increases pressure on the brain possibly pushing against the eyes. This may affect the shape of the eye and permanently affect vision. Cosmonauts Oleg Artemyev and Sergey Prokopyev are getting ready for a spacewalk on Aug. 15. The duo reviewed the translation paths to their work sites on the outside of the station’s Russian segment. During the near seven-hour excursion, the spacewalkers will hand-deploy four tiny satellites, install antennas and cables on the Zvezda service module and collect exposed science experiments.